Who says nothing ever happens in Kigali? Well, me. Kind of a lot. But I was wrong! Rwanda as a whole has a bunch of kind of awesome events on each year and I didn’t even realise it until I sat down and compiled this list. I was a fool! A fool, I say! To save myself from having to remember to change the dates each year and then becoming that big jerk who doesn’t update things and gives crappy information, I’ve decided just to leave the exact dates off altogether. Which is also kind of jerky but I think there are enough links on offer that you can investigate the situations yourselves and get the most accurate information straight from the source. True… many of these websites are crappy and many of the Facebook pages don’t seem to have been touched in some time but there should, at least, be some sort of a contact address or phone number. Prices might be right or they might be wrong but they’ll give you a rough idea at least. If you find that info has changed since I’ve written this article, give me a shout at kirsty@livinginkigali.com and I’ll fix it, I swear! Well, for your event-planning-pleasure, here’s a big list of annual Rwanda events. I’ve written my take on the ones I know anything about or have attended but there are a lot that are still a mystery to me. If you happen to make it to any of the mysterious events or have extra information for me to add to the article, get in touch. Also stay tuned to my Kigali events calendar for exact dates as each event approaches. The RDB Business Awards website is a fine example of a hideous website that tells the reader nothing. So I can’t really say anything about this event. Come on RDB… you can do better! Cost: Rwf 10,000-ish to enter and Rwf 1,000 to watch (for admission to Cercle Sportif). Though I think declaring that your sport is ‘ultimate’ falls somewhere along a yet-to-be-identified spectrum of douchy-ness, I have to admit that it’s kind of a cool sport. 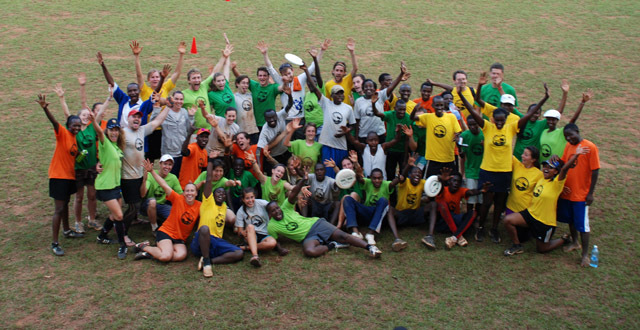 Frisbees, running, catching, teamwork… seems like a good combination to me. 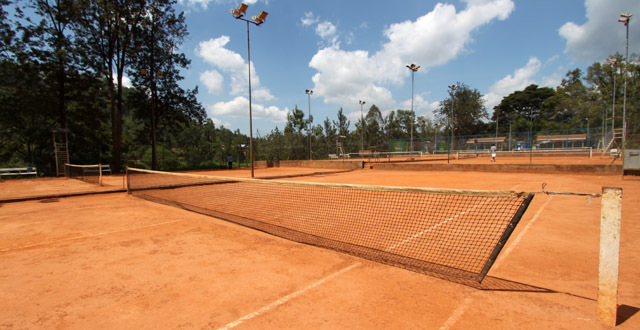 The group of players in Kigali is a dedicated bunch, playing up to three times a week, sometimes as early as 6am (check their Facebook page for their training times). The tournament has grown out of this group and also welcomes teams from neighbouring counties. Get a team together and join in, or just stop by Cercle Sportif to show your support. This cultural festival seems to bring together a lot of different cultural activities – dance, poetry, theatre, short films etc. The festival’s first year was in 2013 in Kigali and it’s meant to rotate through East African countries so maybe it’ll be back in town again sometime soon or it may take awhile to rotate back here. I’m not sure but something to keep an eye out for, anyway. Where: Various venues around Rwanda. 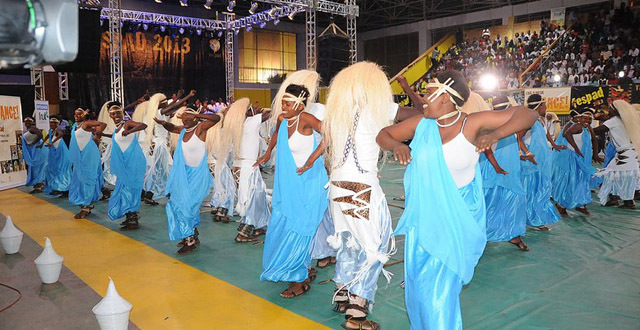 This pan-African dance festival is held in Rwanda every two years. Looks pretty cool and I remember there being some pretty interesting events on last time. The Salax Awards appear to be an annual awards show recognising musical talent in Rwanda. According to this article there are plenty of live performances and a variety of different awards give out. Seems like a great way to see the who’s who of the Rwandan music industry. Unfortunately I can’t find any information on tickets… can anyone help? Cost: In 2013 it cost Rwf 2,000 for Rwandans and residents and Rwf 6,000 for everyone else. Watching is free, just pick a spot somewhere along the route. Walk, run, run for a bit longer, watch… whatever you choose. 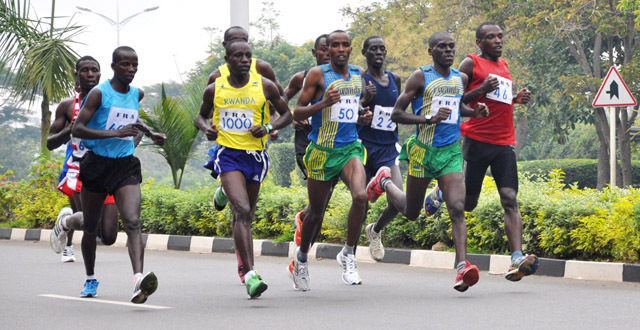 This yearly marathon, half marathon, and fun run is open to everyone and it’s a great way to see Kigali and to truly experience the hills – experience them in a way that might kill your legs. It’s a popular event and a great day spent cheering on your friends or getting a bit of running in. Where: A different embassy residence each year. 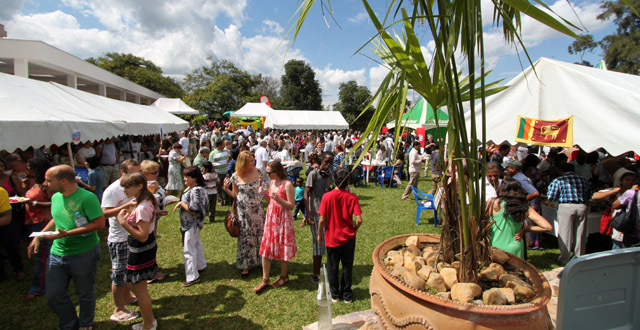 This food fair brings some of Kigali’s restaurants and embassies together to showcase world cuisines. I was actually pretty impressed with the choices the year I went – everything from burgers from the States to a French fondu to a table of Sri Lankan food surprises. The year I went it was set in the Belgian residence which was a great venue. It’s a good day for feeding your face while hanging out with lots of foreign invaders. Cost: There are various events and costs. A baby gorillas event? Too cute to exist, you ask? No! 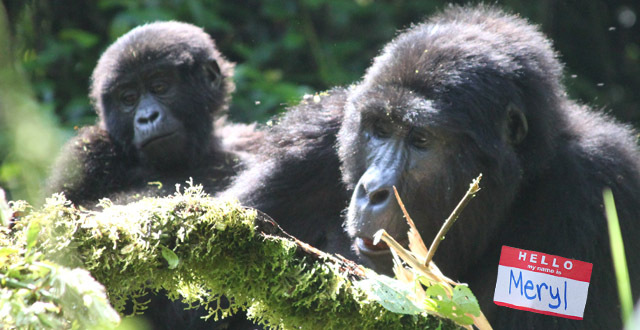 It happens every year in Musanze as the previous year’s newborn gorillas are given names. There are a bunch of different events organised around the naming ceremony but I’ve never been to anything so you’ll have to stalk them on their website, Facebook page and Twitter accounts to figure out what will be happening next year. Where: Various locations around Kigali and some showings out of town. Cost: Mostly free with some paid events. The Rwanda Film Festival was founded in 2004 and has grown into one of my favourite annual Kigali events. 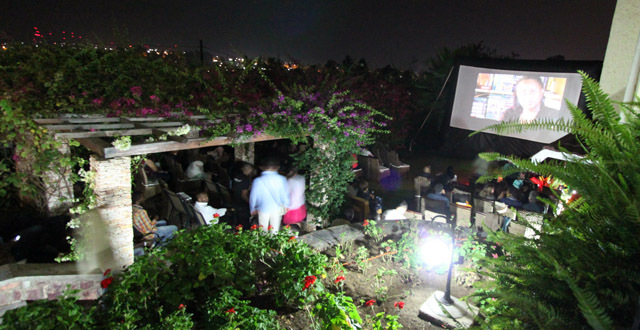 Temporary movie venues are set up in fantastic places all over the city and I think also around Rwanda. The festival runs for a week and offers up several films each day at three or four venues around town. The new Century Cinema at KCT hosted some events for the first time in 2013 as well. Most of the movies are free and it’s a great week to be in Kigali for film fans. The second Kigali Up was held in 2013 so lets hope it continues on into the future. It’s a weekend festival with two full days of music across two stages. The music is pretty varied with a good mix of international artists with a focus on Africans and a Canadian connection due to the organiser being Mighty Popo, an award winning Canadian-Rwandan artist. I didn’t know any of the acts but I’m music handicapped and don’t know really know who anyone is beyond 90’s musicians. Yes, I’m admitting that. Anyway, it’s a fun day out with good entertainment, decent sound, food stalls from Kigali restaurants and a generally chilled out and fun atmosphere. Toilets are a horrifying experience but, besides that, I’d recommend you check it out. Cost: Free? I think. Or maybe around Rwf 2,000? I’ve never really understood what the appeal of trade fairs is supposed to be for the average person. Or even what the point of a trade fair is for people who are a part of the trade fair. Do you get together and set up a stall and find new clients? Is it to showcase your wares? I’m always confused at these things. I went once to the Rwanda Expo and had a great buffet lunch but otherwise couldn’t really figure the thing out. I also bought a yoghurt and somehow found myself continually passing by the roof tiles section. Rwanda has a football league and the Peace Cup is the final. At least that’s what this article tells me. Anyone have more info? Cost: Free but tickets have to be awarded. This year you could also gain entrance with an Rwf 10,000 donation. I really knew nothing about TED talks until recently. Persistently living in countries with crappy internet means that streaming videos online is more of an exercise in pain that one of joy. But I get the gist of it… interesting people talk about interesting things at TED events where rich people pay a lot of money to watch them talk and us mere mortals watch the resulting videos online. Often awesome videos from what I’ve seen so far. TEDx is sort of a branch of TED where events are held worldwide that get together some live speakers, an audience, and video it. 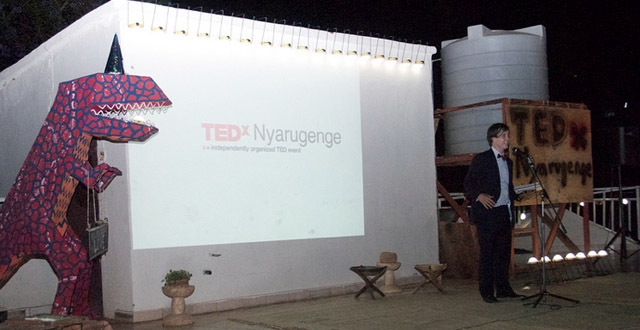 Some fine folks in Kigali took on the major undertaking of organising a TEDx event here and the first one in 2013 was a really great night. I had no idea what this was or how big a deal it is until suddenly all of my friends seemed to be going to it. Then I saw photos and Amahoro Stadium was packed with people. It’s a big deal. It looked like a fun night out and I’m bummed I missed it. So what is it, exactly? Think Rwandan Idol. Or the X Rwanda. Ok, that one doesn’t really work. But it’s basically a nation-wide talent search starting in May and running until July when the public votes their favourites into the finale. Artists travel all over the country performing during this time. Tom Close was crowned the winner in 2011, King James took 2012 and Ryderman won this year’s contest. Who will win next year?? The excitement is almost too much to bear! But you’ll have to wait a whole other year, so sit tight. Where: A secret location announced on the night. Cost: Rwf 13,000 plus food. 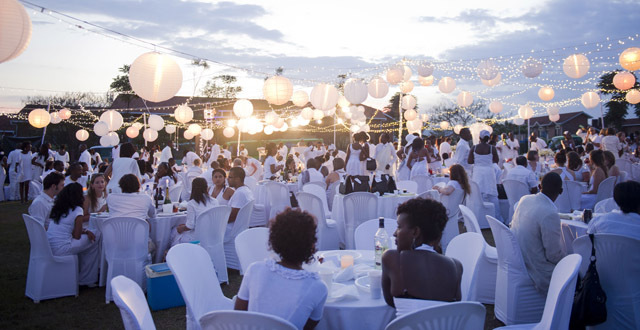 Diner en Blanc is an event that started in Paris where people gather together for a dinner… and wear only white. 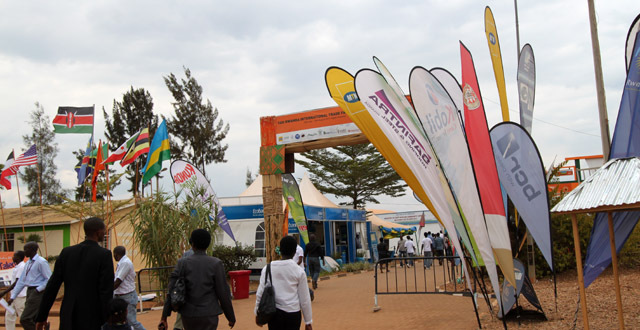 In 2011 Kigali became the first city in Africa to hold the event and both events so far seem to have been a success. You get a group of six people together for your table and have the choice of either bringing your own food or ordering a picnic basket of food from one of Kigali’s restaurants. Then I guess you hang out, wear white, and try not to spill red wine on yourself. Where: Around Kigali with opening at the Gikondo Fair Grounds. 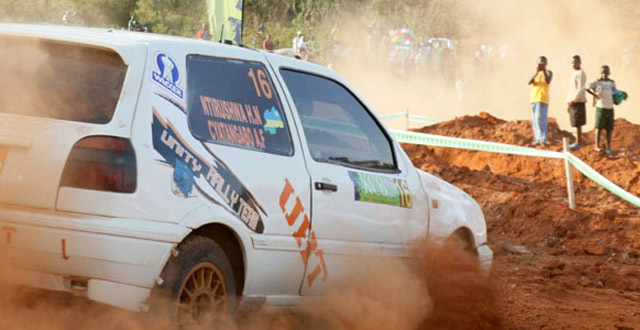 Rally cars in Kigali! That’s certainly something a bit different. The races take place over three days and are a part of the African Rally Championship which takes place across several countries on the continent. Unfortunately their website doesn’t help much with information for spectators. Where: Last year it was at the Gikondo Fair Grounds, the two years before were at Juru Park and the first year was at Caiman. So… who knows! Ah Beerfest. It was the best of times, it was the worst of times. 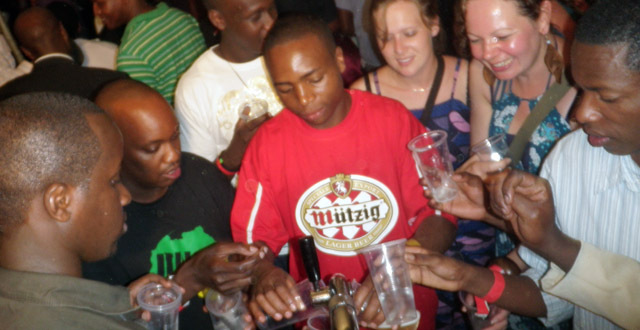 But really… Mutzig Beerfest 2010 was one of the best nights I’ve had in Kigali. All fun up there on the hill at Juru Park with beer flowing, music playing, and just general good times being had. Going in with low expectations certainly helped. Aaaaaand then there’s Beerfest 2011. By far, the worse night I’ve had in Kigali. Trapped up on the hill at Juru Park with no food and… no beer! After several wrestling matches to attempt to get close to the kegs I eventually managed a half a glass of foam. Mutzig Foamfest 2011. Not quite as fun. But, though I was too scared to return in 2012, I’m told that they managed to redeem themselves. The venue was moved to the much more accessible (but far less beautiful) Gikondo Fair Grounds and nobody (that I know of) left that fest filled with rage. I don’t know much about this event itself but I know a bit about Team Rwanda. Due to their success, cycling here has become a pretty popular sport and I’d say that lining the roads to watch the riders zip by would be an exciting day. 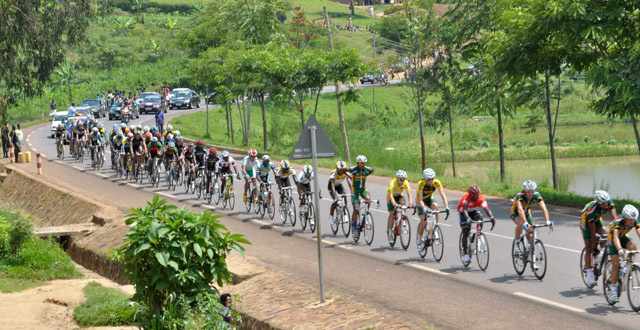 The race consists of seven stages for a total of over 800 kilometers of riding through Rwanda’s hills. When: Over a week in November. Where: Various places across Rwanda. Global Entrepreneurship Week (GEW) is held each year in November all over the world. 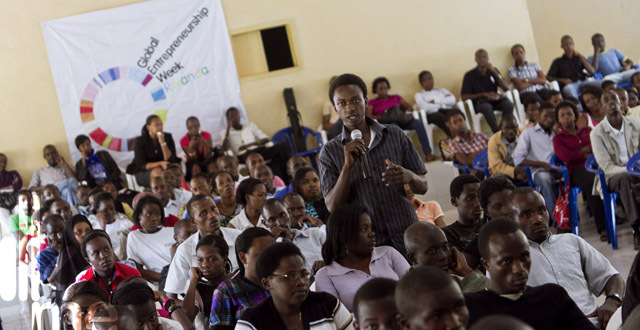 The Rwanda event connects and engages local business owners, people with big ideas, young people and anyone interested in entrepreneurship through a series of events and competitions over the course of the week. I went to an event in 2012 at The Office which brought some business-savvy young students into contact with entrepreneurs in Kigali. That was just one of a collection of successful and inspiring events. If you’ve got any interest in entrepreneurship or business in Rwanda you’ll want to make some time to attend some of the week’s events. The Happy People party takes place every New Year’s eve. Can I find any information at all about it? Nope. do all of your shopping in one place. Kids Corner 2000.. bouncy castles and more. Lots of food and drinks available, too!